Merry Christmas Blog Buddies! And what a whirlwind it has been! Yesterday, we did 5 back-to-back Christmas Eve services that were incredible. It was a light-show spectacular and one of the most awe-inspiring worship settings BAF has ever created. And what was really cool was the display of God's glory that filled the sanctuary as each and every team member used their gifts and talents to help create an experience that truly magnified the Lord. It is absolutely amazing to watch God use His people in such creative ways. He is genius! I pray that you all have had a very blessed Christmas! And I want you to know how grateful I am to each of you who have prayed for me and with me in these last several weeks. God has been faithful and your prayers have definitely been felt. Even with major surgery, God has allowed me to be a part of all the wonderful things I had hoped not to miss. I will keep you posted, but for now, please know that you are some of the sweetest "flakes" in my snowglobe and I treasure each and every one of you! Praying for you. god is there and he is our healer for all things. "For by His striped we are Healed"
It was great seeing my friends jam out on stage! 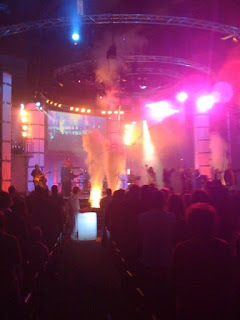 We went to the 4pm service, and it was awesome!!! Continuing to pray sweet friend.